Edouard Manet born in Paris, at 5 rue des Petits-Augustins (now rue Bonaparte), eldest son of Auguste Manet (1797-1862), a high-ranking civil servant in the Ministere de la Justice, and Eugenie-Desiree Fournier (1811-1895), the daughter of a French diplomat posted to Stockholm. Birth of his brother Eugene (d. 1892). Birth of his brother Gustave (d. 1884). Primary education at Abbe Poiloup's Institut in Vaugirard, which he dislikes. Secondary education at the College Rollin, where he meets Antonin Proust (1832-1905), a lifelong friend whose memoirs shed much light on Manet. The two friends often visit the Louvre together, under the guidance of Manet's maternal uncle, Edouard Fournier, who encourages his nephew's talent for drawing. 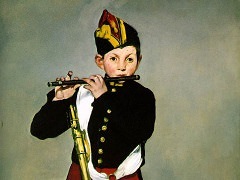 Report from College Rollin describes Manet's work as "wholly inadequate". Leaves the College Rollin intending to enter the Ecole Navale, but fails the entrance exam. Embarks for Rio de Janeiro aboard the trainee-ship he Havre et Gaudeloupe. During the trip, draws caricatures of the officers and commandant. On his return to Le Havre, again fails the entrance exam for the Ecole Navale; his parents reluctantly agree to his attempting a career in art. Meets Suzanne Leenhoff (1830-1906), a young Dutch woman who gives piano lessons to Edouard and his brothers. Enrols as student on the register of copyists working in the Louvre, and, with Proust, enters the rue Laval studio of the academic painter Thomas Couture (1825-1879). Despite many arguments - "I don't know what I'm doing here" - he remains for six years. With Antonin Proust, witnesses the bloody coup d'etat of Napoleon III and sketches the dead in the streets. Both arrested during skirmishes and detained for a few nights. Birth of Leon-Edouard Koella, known as Leenhoff (d. 1927), Suzanne Leenhof's illegitimate son, whom Manet is thought to have fathered. Travels to Holland. Copies Boucher's Diana at Her Bath in the Louvre. Leaves for Italy with his brother Eugene. Copies old masters, in particular Titian's Venus of Urbino, which he later uses as a template for Olympia, and Lippi's Head of a Young Man, both in the Uffizi. Meets Fantin-Latour studying Venetian paintings at the Louvre, and, on Delacroix's recommendation, copies Portrait of Helene Fourment and her Children of Peter Paul Rubens. His Absinthe Drinker, in the style of Velazquez, is refused by the Salon, despite Delacroix's favourable judgment. Exhibits the Portrait of Monsieur et Madame Auguste Manet and The Spanish Singer at the Salon; the latter receives a mention honorable. Meets Victorine Meurent who becomes his mistress and favourite model. Exhibits 14 pictures at the Galerie Martinet, including Music in the Tuileries, Lola de Valence, Spanish Ballet. Napoleon III, finding the Salon jury excessively severe, demands the creation of a Salon des Refuses; there Manet exhibits Le Dejeuner sur l'herbe, and Mille V... in the Costume of an Espada. With Baudelaire, attends Delacroix's funeral. Marries Suzanne Leenhoff in Holland. Baudelaire writes to Carjat: "But he has some excuse: it seems his wife is very beautiful, very good-natured, and a very great musician. So many virtues in a single person, it's monstrous, don't you think?" Poses for Fantin-Latour's Homage to Eugene Delacroix, which is exhibited at the Salon. Witnesses the combat off Cherbourg of two American ships, the Kearsarge and the Alabama, and makes a picture of this "news event". Exhibit Olympiaand Jesus Mocked by the Soldiers at the Salon. 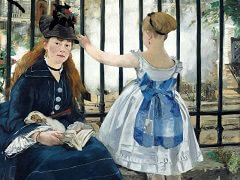 Depressed by public and critical reaction, Manet leaves for Spain. Survives cholera during the epidemic. 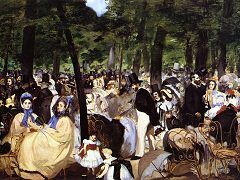 Organises a solo exhibition featuring 50 pictures in a specially built pavilion, paid for by Mme Manet's mother, near the Pont de 1'Alma, just outside the Exposition Uni-verselle. Gustave Courbet does the same. The Emperor Maximilian is executed in Mexico. Manet attends Baudelaire's funeral. Paints a Portrait of Zola in gratitude for services rendered, which he sends to the Salon. Advises Berthe on her painting; she models for The Balcony. The Execution of the Emperor Maximilian is refused by the Salon, and the lithograph banned. The printer at first refuses to return the stone, wanting, indeed, to efface it. Manet to Zola: "I thought only publication, not printing, could be prevented; at all events, it's a compliment to the work". By contrast, the Salon accepts Lunch in the Studio. Berthe Morisot writes to her sister: "Poor Manet is sad. As usual, his exhibition is not much appreciated by the public; he never ceases to be surprised by this ...". Manet takes on Eva Gonzales as his pupil; Berthe Morisot resents his obvious favouritism. Manet informs his family of the end of the Siege of Paris, and describes the pitiful state of the Parisians. He writes: "I long to embrace you all. I have just this instant learned that poor Bazille was killed at Beaune-la-Roland on November 28". 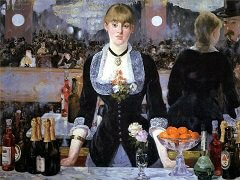 Durand-Ruel buys 24 paintings from Manet and exhibits i4 at the Society of French Artists in London. The Cafe Nouvelle-Athenes, place Pigalle, replaces the Guerbois as a meeting-place for Manet's friends: Degas, Monet, Renoir, Pissarro, and others. With his brother-in-law, Ferdinand Leenhoff, visits the recently-opened Frans Hals Museum at Haarlem, and the Rijksmuseum in Amsterdam. Moves to 4 rue Saint-Petersbourg, where his first-floor windows offer a prospect of the construction of rue Mosnier. Le Bon Bock has some success at the Salon, where it is shown alongside Repose. 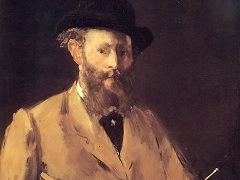 Albert Wolff remarks that Manet has "watered his beer". Alfred Stevens, referring to the influence of Hals, alienates Manet by his witty retort: "Water? It is the purest Haarlem beer". Meets Mallarme. Sells five paintings to Faure, the famous baritone. The Salon accepts The Railroad but refuses The Swallows. 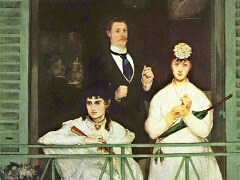 Mallarme publishes his article "Le Jury de Peinture pour 1874 et M. Manet" in La Renaissance artistique et litteraire. First Impressionist exhibition, held in Nadar's studio, boulevard des Capucines. 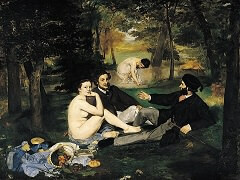 Manet refuses to take part. Berthe Morisot makes a "marriage of convenience" with Eugene Manet. Manet illustrates Mallarme's French translation of Edgar Allan Poe's "The Raven". At the Salon, exhibits a veritable manifesto of Impressionism: Argentueil. Travels to Venice with his wife and Tissot. To please Mallarme, illustrates his poem "L'Apres-midi d'un faune" with woodcuts. Opens his studio to the public to present pictures of his refused by the Salon. Among the many visitors is Mery Laurent, his future muse and model. Overtly supports his Impressionist friends during the third Impressionist exhibition, though he still refuses to take part, preferring to try and "break into" the Salon. The singer Emile Ambre, an admirer, takes Manet's Execution of the Emperor Maximilian with her to the United States and exhibits it in New York and B oston. At the Salon, Manet exhibits the Portrait of Monsieur Antonin Proust and Chez lepere Lathuille, The Plum and Corner of a Cafe-Concert. Manet's health is declining. Dr Siredly prescribes hydrotherapy and a stay in the countryside. Antonin Proust is appointed Ministre des Beaux-Arts, and hastens to make Manet a Chevalier de la Legion d'honneur. Manet's health worsens. He exhibits Bar at the Folies-Bergere, his health having made its completion an ordeal. Again exhibits Corner of a Cafe-Concert, this time at the Lyon Salon des Beaux-Arts. 20 April: his left leg is amputated. He dies on 30 April and is buried at the Passy cemetery on 3 May. According Le Figaro, the pallbearers were Antonin Proust, Emile Zola, Philippe Burty, Alfred Stevens, Theodore Duret and Claude Monet. Edgar Degas, leaving the cemetery, reflects: "He was greater than we thought..."